ATTENTION! Polish plumbers and Polish builders! Obsolete and discontinued replacement baths by Trent Bathrooms, Armitage Shanks, Ideal Standard, Qualitas, Doulton, Twyford and Spring to name but a few. 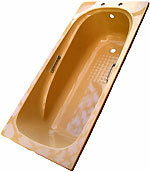 A standard shape bath is rectangular and generally measures 1700mm by 700mm. These dimensions however, do vary considerably and so all baths should be measured carefully. Please view our guide and then fill out our enquiry form for one of our experienced team to get back to you.